LTE has become tech lingo of the town in Indonesia recently. Two major mobile operator launched commercial LTE services in less than three weeks span from each other. In the midst of this hype, i have been asked LTE 101 questions several times by my friends. Ive been involved in LTE strategy development for the past months so ive learned one or two things about this stuff. For my personal notes and time-saver when the question arise again, ill summarize my knowledge in a form of FAQs. It is the newest upgrade in GSM-based mobile technology. HSDPA (3G GSM) has been existing for 10 years and now its time for new generation (4G) to start stepping in. Whats the difference ? Technically, it is a lot. HSDPA was designed as a bridge between old circuit based telephony system and the new packet based data communication. LTE was created to furthermore optimize the delivery of high speed data service. So no more circuit switching, everything is IP based. In short, LTE will be much more faster than HSDPA. Is it already available in Indonesia ? It has been since last year with limited availability. New entrants Bolt launched the first commercial LTE services in 2013 covering Jakarta and Bogor. Since Bolt doesnt have cellular operator license, it can only offer mobile internet using wireless LTE modem and without voice and sms services. Incumbent market leader Telkomsel launched LTE services earlier this month. The services will cover almost 200 sites in Jakarta and Bali. XL followed soon with three cities : Medan, Yogya and Bogor while Jakarta is still in testing status. 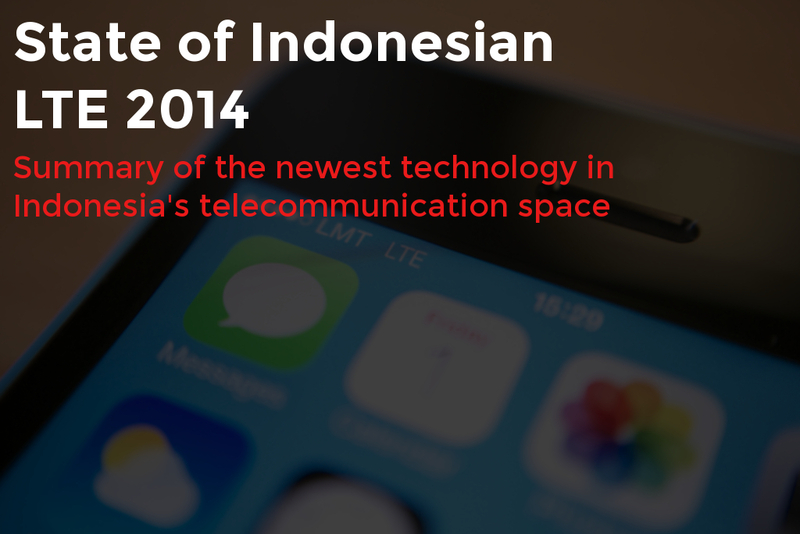 The last of the big three to follow LTE bandwagon was Indosat with limited coverage in Jakarta. Smaller players such as Smartfren, Tri and Bakrie telecom hasnt launched yet but they already making their move. How much speed will i get ? Big three operators claimed that their LTE is capable to deliver up to 36 Mbps (links on the previous paragraph). If you notice, this is actually slower than HSPA+ which can reach up to 42 Mbps. The reason for this is the lack of spectrum. Indosat CEO Alex Rusli explained briefly in this article but let me try to explain it with more detail. Government currently only allowed GSM operator to use 900 Mhz spectrum for LTE. As you can see in the graph, 900 is the least owned spectrum. The spectrum also being used for 2G hence its impossible to use it exclusively for LTE. This is why all big three operator only allocated 5 Mhz of their 900 spectrum. 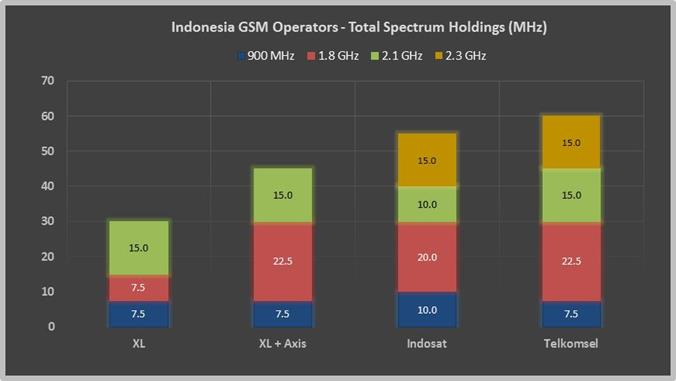 Below is spectrum allocation chart for big three operator in Indonesia. To deliver “real” LTE speed of 72 Mbps, 10 Mhz of spectrum space will be needed. Obviously this is not possible in 900. The ideal spectrum allocation for LTE is actually 1800 Mhz. Almost all telco player have sizeable portion of this spectrum and it is currently the most common spectrum for LTE. Unfortunately , the allocation in this spectrum is a mess. Government, in this case BRTI, will need to do spectrum reallocation to make sure each operator has contiguous spectrum before giving a good to go permission for 1800 LTE. What about Bolt ? Bolt used a different spectrum (2300 Mhz) from the rest of players. Internux (company behind Bolt) has an ample 15 Mhz of spectrum hence it can deliver more than enough speed. Bolt currently used 10 Mhz and advertised maximum speed of 72 Mbps. One last point for LTE speed. Even though with current deployment LTE maximum speed is slower than HSPA , on average you will get much more higher speed due to relatively empty network. With the minimum price of 7.5 mio IDR for LTE enabled handset, not that many people will be able to use the services. Can i use it in my phone? First thing to check is whether your phone has LTE capability and support 900 Mhz spectrum. Use sites like gsmarena and check the supported LTE band. You can also see the list of supported phones in the operator’s site such as Telkomsel and XL. Secondly you need to replace your current SIM cards with an enhanced version called USIM. You can get it for free in the operator’s contact centre. Phone number will still be the same so dont worry. Unfortunately theres some problem if you are using Apple products such as Iphones and Ipads. Apple has policy to test operator’s LTE service before enabling LTE in their phones. As i know, Indonesian operators havent got their certification. Probably due to subpar LTE speed compared to other countries. For more information on Apple and Indonesia LTE incompatibilities , check this excellent piece from Aulia Masna. What should we expect going forward ? The services is still in an infancy status. Speed are good but not that great, coverage is extremely limited and the handset is still very expensive. Indonesia ICT minister Rudiantara has commited to fasten the due processes for 1800 spectrum. This will improve the speed and coverage part. It will probably take more time for LTE handset price to go down. Lower end manufactures such as Xiaomi already have LTE phones in the 3 Mio price range however 900 band is not supported yet. Do you have questions, comments or feedbacks? drop it in the comments and i will try my best to answer. Thanks for reading.